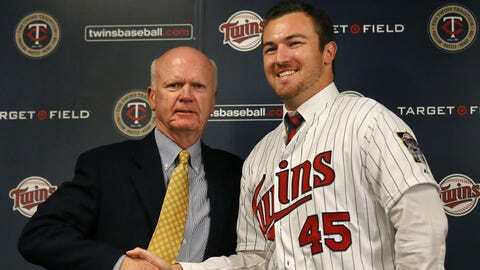 Twins GM Terry Ryan is hoping for a bounce-back sesaon from Phil Hughes. Minnesota Twins’ starting rotation last year: it was bad. (.305) of all 30 starting staffs. Hughes, Minnesota’s rotation will arguably be better than it was a year ago. Just how much better, though, remains the question. deal was the largest free-agent contract in Twins history. with a 3.52 ERA with Los Angeles late in the year. needs to revitalize his career. games, Arroyo could be a good fit in Minnesota. the other, but acknowledged that the roster as a whole remains a work in progress. “We’ve got to continue to try to improve this team. the mound was one reason they were drawn to Minnesota. should be good to go this spring. to crack the starting rotation. rotation even more and provide an added level of competition this spring. steady the rotation in 2014.
innings and deeper into games to give ourselves a chance,” Ryan said.